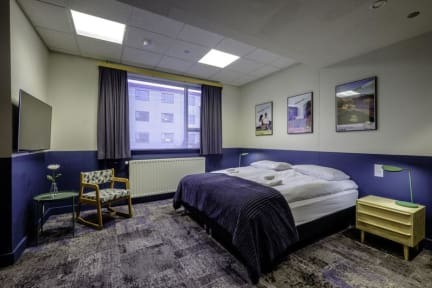 Basehotel/hostel is a newly renovated budget hotel located close to Keflavik International Airport with easy transportation to and from the airport. The location is excellent for travellers looking to explore the hidden gems of the Reykjanes Peninsula such as The Reykjanes Geothermal Park, The Blue Lagoon (17km), Gunnuhver hot spring and the many caves and exotic landscape surrounding the area. 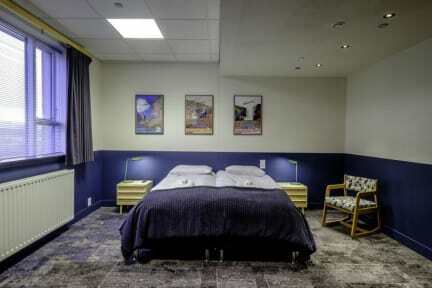 The Base has 121 rooms and dorms, with new beds and free WIFI in every room. The 24 hr reception and bar is very spacious, convenient for large groups. There is a gift/food store on site, TV lounge, library, game room, free arcade games. Well equipped community kitchens, laundry area and brand new bathroom facilities. Free parking is available. At Base it is possible to rent cars or book tours at a discount. Ask the reception for their expertise on what to do and where to go. Whether you are staying with us for an extended period of time or just on a quick stopover before or after your flight in Iceland. Base is the place for you. Breakfast not included - 2000 ISK per person per day. Great stay. Exactly as represented and upgraded to a private room! Thanks Base! Great stay, got upgraded to a private room. The overall facility was great. My only issue was that there was no where in my room to charge my phone. I had to go out to a common area. Great location convenient to the airport. Incredibly helpful staff. Basic accommodations, exactly as advertised. Great value. This hostel is an affordable option for Iceland, the beds in the dorm rooms are extremely comfortable & the bathrooms are spacious & great for privacy. The hostel was very clean and well heated. The staff wasn’t exceptional and we didn’t get much of a vibe as far as an atmosphere goes, but all our basic needs were met. It was great for a quick stopover & we would definitely stay again. Had a little trouble with the other guest sharing the bathroom with us, as they soaked the entire bathroom floor while taking a shower. Other than that, the room was clean and the beds are comfortable. There is a bar downstairs and breakfast available for purchase. The friendliness of some of the girls working was questionable. They seemed to be a little immature, didn’t speak with me once even when I was near the bar alone and felt as though I should’ve been asked if I would like anything. Know you're in former US military barracks. There're NO OUTLETS in the rooms... not even a bathroom on each floor (sink in your room tho). Woman we checked in with was extremely rude and clearly just trying to gouge us for whatever she could nickel and dime us for. The common areas are nice, they have TVs, couches, and plenty of games. We basically lived off of the vending machine. Breakfast is 12,000 Íkr for yogurt and cereal. Only food is expensive (but low-key fire) Dominos. The only reason to stay here is for an early flight the next morning. It was expensive and with nothing to do. In the building I stayed in, there were three floors with one room for showers total - not one per floor, one total. When I checked in, I was assigned a bed in the 12-person dorm I signed up for. There were four total people in that 12 person dorm and they put all four of us into two bunks instead of spreading us out, or asking us if we'd prefer a top or bottom bunk in that situation. Only one staff on bar and checkin desk - not enough. No socket in room to charge phone, had to go down to the bar. Toilets not very clean. Location is good only if you are flying out early the next morning as there is nothing around to do. Bottom rung of ladder on bunk bed broken.